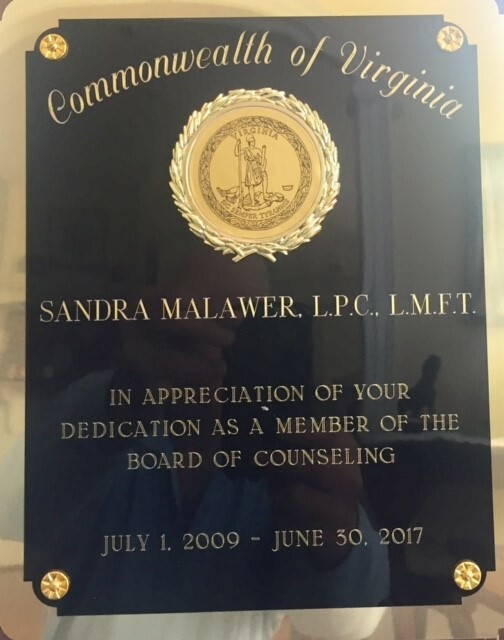 8 Years as a Board Member of the Virginia Board of Counseling. | Couples-Counseling Connection — Marriage & Family (McLean, Virginia). Couples-Counseling Connection — Marriage & Family (McLean, Virginia). 8 Years as a Board Member of the Virginia Board of Counseling. Served 8 years as a gubernatorial appointee on the Board of the Virginia Board of Counseling. This is the licensing and regulatory agency of the Commonwealth of Virginia for licensed professional counselors. A great experience. But now glad to avoid the traffic on I95. This entry was posted in Communications by sandymalawer. Bookmark the permalink.